In celebration of the first day of spring, I set out on my second recipe of the challenge. What says spring better than pant shorts (which, by the way, I am officially wearing as of today!) and asparagus! The magazine claimed this recipe to be easy, however, my first hurdle came by way of the puff pastry. I couldn’t find for the life of me a 9 1/2 by 9-inch square sheet of it, and had to get instead two lumps that required some heavy handed rolling to get into shape. I also neglected to see if we had any parchment paper, which we did not, but we did have parchment bags (which I must have got in some sort of swag bag because pretty positive it’s not something we would have purchased ourselves.) so I got the scissors out and made a flat(ish) piece of parchment paper 🙂 My next obstacle was the baking of the pastry. While I had pie weights (not sure why given we don’t eat pie in this household!) it seems I didn’t have enough and when I pulled the pastry out of the oven, the middle had puffed right up along with the edges. Meh, no biggie, I could work with it. Seeing as how it was the first day of spring (which really didn’t seem all that springy with the heavy dark clouds looming and the ice cold wind blowing!) I figured I would take Little Ring and I out for a walk in between letting the pastry cool and starting the next steps of the recipe. We got back home at 5:15, and while I was a tad bit stressed to get the dish in the oven and eat before Little Ring got his crank on, it seems the remainder of the recipe was quite easy after all – chop the asparagus, pit and chop the olives, spread the goat cheese and we were good to go. Now, let me tell you, my belly is a finely tuned machine that doesn’t like change all that much. And while this tart was freaking tasty, even Big Ring was enjoying the Kalamata olives despite his worries about whether or not he’d like them, my belly soon waged war on my head. My head wanted more. My belly did not. It seems the goat cheese was a wee rich for my intestines. And as such, well, let’s just say I spent an AWFUL lot of time in the washroom that night and the next morning! So, if your belly can only handle so much richness, I would advise to (a) keep the meal at one square – NOT TWO! – or (b) make this a wonderfully tasty pre-meal appetizer! 2. Leaving pan on pastry, bake on lower-middle oven rack for 20 minutes. Remove pan, rotate sheet, and continue to bake until pastry is golden brown, 5 to 10 minutes. Let cool for 30 minutes. 3. Meanwhile, combine asparagus, scallions, 1 tablespoon oil, olives, garlic, zest, salt and pepper in bowl. In separate bowl, mix 3/4 cup goat cheese and 1 tablespoon oil until smooth. Spread goat cheese mixture evenly over cooled puff pastry (avoiding raised border), then scatter asparagus mixture over top. Crumble remaining 1/4 cup goat cheese over top of asparagus mixture. 4. 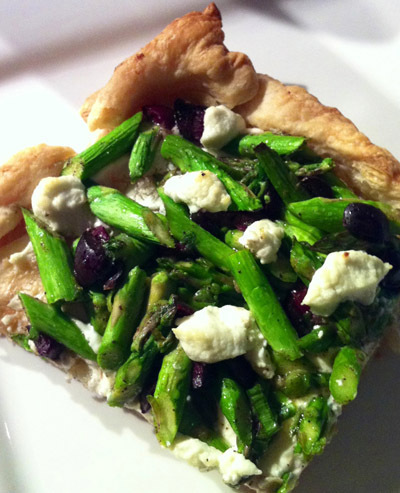 Bake tart on top oven rack until asparagus is tender and tart shell has darkened slightly around edges, 10 to 15 minutes. Let cool for 15 minutes. Drizzle with remaining 1 tablespoon oil. Cut into 4 equal pieces and serve. UGH. Well, it looks delicious, but I hear ya on the tummy pain! For now, most of the ingredients in that tart are out for me… so I’ve been eating my weight in cornbread instead!